Recently I have had the opportunity to start looking at laboratory Quality in a whole new light. Medical laboratories have only recently been introduced to the concept that they are businesses that have customers and that these customers have certain rights and expectations. Quality oriented laboratories need to take customer satisfaction in mind because unhappy customers can make complaints that at a minimum can disrupt smooth administration, or they can create terrible publicity and public awareness, or the can sue. In many parts of the world, they can drive business away and the laboratory can starve for work (and revenue). Unfortunately this is still all very new in the laboratory arena, and only the barest of minimums of activity are yet in place. Few laboratories are much beyond the complaints form, and for those that are few are doing anything to really capture clinician or patient sentiment. But to be fair, progress is slowly being made. In the early 1980s Noriaki Kano, an academic in quality management and customer satisfaction wrote a lot about satisfaction. 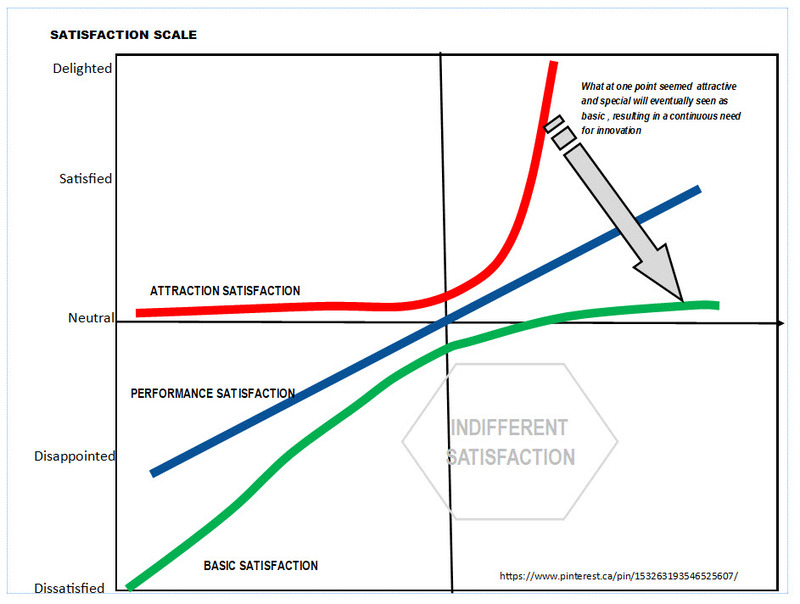 Although his target audience was neither healthcare or medical laboratories, as I read about his model of satisfaction (referred to appropriately as the Kano Model) I can see how much of it directly is referable to the medical laboratory and quality improvement. Kano wrote of 4 identifiers or attributes of product and service development in the context of customer satisfaction (A) Basic or Threshold (B) Performance or Linear, (C) Attraction or Delighters(!) and (D) Indifferent. Basic satisfaction occurs when the customer gets used to having the product when they want it, then then get really annoyed when it is not available. An example of this might be providing staff in the Emergency Department a simple point of care test to detect an infection, but then saying it will not be available for use on Wednesdays or the weekend. Performance of linear satisfaction is said to be positive when the service is performed and negative when the service is withdrawn. A good example of this would be when an laboratory announces that in order to make the life of elder or very young patients easier, they offer to go to the patient’s home for sample collection rather than making them go the clinic, but then not providing the service when the driver or the collector goes on vacation for three weeks or if they decide they won’t collect the sample because maybe the patient has the flu. 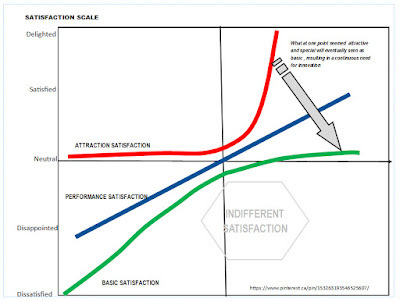 Attraction or Delighter satisfaction occurs when the customer is REALLY pleased when the new service or product is available and enjoys its presence, but is not dissatisfied when it is not. It is seen as something of special value. It’s like when you go to the laboratory and get seen by a phlebotomist who is not only efficient and effective, but is also happy and congenial and helps take away the anxiety of visiting the laboratory. Or perhaps when you receive a laboratory report there is an informative note that helps put the result into better perspective. What Kano pointed out is that once an attraction/delighter action is first put into place, it is seen as something novel and keen, but overtime, everyone just assumes that it should be the norm, and gradually it shifts from being an attraction/delighter satisfaction attribute and becomes a basic one, that people expect all the time, and get really annoyed when it is no longer there. Finally there is what Kano called Indifferent Quality which describes quality efforts that the customer knows nothing about and is unaware if they are present of absent and have no tangible impact on satisfaction. This with regret accounts for maybe 99% of the things that we do under the banner of Quality Management and Quality Improvement. (We know, but nobody else is aware). If (and that is a BIG if) documents like ISO15189 or other standards/guidelines start pushing for more innovation in laboratory customer service and more clients start demanding a higher level of attention and care, these concept are going to become very real and very familiar in your neighbourhood laboratory.